Note: For a more recent tweaked ingredient list and bag design, open up Lawless Jerky – Aloha Teriyaki 100% Grass-Fed Beef Jerky (Recipe #2). 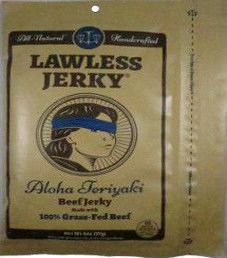 The first review on Lawless Jerky will focus on a 2 ounce/57 gram bag of their Aloha Teriyaki flavored 100% grass-fed beef jerky. This jerky was graciously submitted by the founder and CEO, Matt Tolnick. The Lawless Jerky brand name is distributed by Lawless Jerky LLC, located in Santa Monica, California. Matt, a former attorney, bravely left his practice, and launched the Lawless Jerky brand name in 2013. 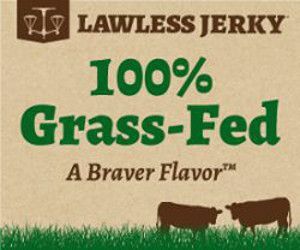 In Matt’s words “he had the courage to run from the law..to make jerky!” The trademark for Lawless Jerky is “A Braver Flavor™”! 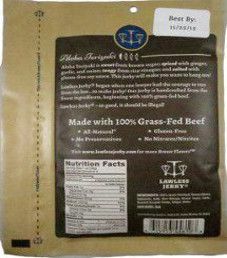 Their signature for us is that Lawless Jerky commendably uses 100% grass-fed beef. The liquid marinade consists of tamari soy sauce, and rice vinegar that are both popular in Asian cuisine. Rice vinegar is made from fermented rice or rice wine. It offers multiple health benefits such as having essential amino acids that fight free radicals. The trifecta is captured for a teriyaki based flavor, where supremely healthy garlic, ginger, and onions are used. Sesame seeds are also very healthy. The sugar level is a bit high with 6 grams of sugar per 28 grams of jerky. For a sweet based flavor such as teriyaki, the preference is 5 grams of sugar or under. The salt level is high at 400mg of salt per 28 grams of jerky. Our preference is 350mg of salt or less. As advertised, there is no sodium nitrite used, or any other similar unhealthy preservative. Instead, salt and rice vinegar to a lesser extent are the main preservatives. With more kudos to Lawless Jerky, their jerky has no MSG added. 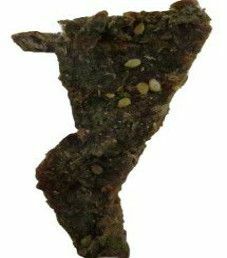 The strips of jerky are medium in size, and also sliced to a medium thickness. 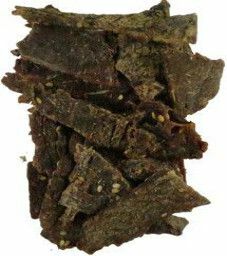 There is a great dry texture, where chewing this jerky is a fairly easy experience. We do not see any signs of fat, and handling this jerky leaves no oily residue on your fingers. The first taste detected is a mild soy taste, along with the natural beef flavor. Soon afterwards the spices start to kick in. The onion and garlic tastes are mild, and the ginger taste is moderate. Sesame seeds and ginger are a great taste combination. There is a light sweetness, and also a light tanginess to this jerky. The term Aloha may imply that this jerky has a Hawaiian flavor, but it has more of an Asian flavor. This flavor is very tasty and delicious. This 2 ounce/57 gram bag retails online for $6.99. That equates to $3.50 an ounce, which rates as an expensive price. If you order all six flavors online, the price is $34.99, which works out to $2.92 an ounce. 100% grass-fed beef is not cheap, but is the healthiest beef you can get. For certain this jerky is worth your money. All bag categories are covered with this bag except for one. Missing is a transparent window to view the actual jerky. There is a good blurb on the back written about the aloha teriyaki flavor itself, and about Lawless Jerky.